There are three kinds of comic book Kickstarters. One is from seasoned pros who want to do their own project – perhaps with a set of new intellectual property. A second is from indie creators who have published some work – perhaps digital only – and want to head to print to widen their potential audience. A third is from an unknown – maybe an artist in another medium, or maybe someone publishing their first work. I’ve pledged to all three kinds of Kickstarters and I’ve seen all three fail. Yet, the first two have a leg up on the third in existing support and goodwill of their audience. You’re not likely to get angry at your favorite creator for telling you their project will be a month late or ten pages shorter than planned. The artists in that third category have no leeway, not an inch of slack. To convert you from one-time speculator to long-term supporter they have this single chance to win you over – to impress you on every level. I’ve pledged to all three kinds of Kickstarters and I’ve seen all three succeed. Yet, the third are the ones that most often stun me. Story and art by Barrett Stanley. 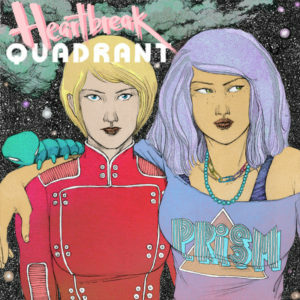 Buy Heartbreak Quadrant for $15 at the Red Grapefruit online store. 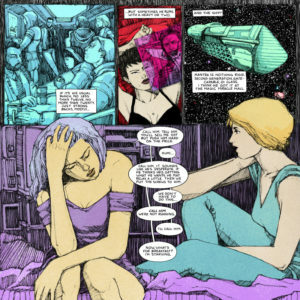 #140char review: Loved the penstrokes & handcrafted colors of Heartbreak Quadrant: 2 women space scavengers in a vivid sci-fi world full of personal touches. Heartbreak Quadrant is a vivid slice of sci-fi crammed with big ideas but primarily about people. Click to view this page in context on Tumblr. Barrett Stanley’s artwork is a revelation. An experienced oil painter, in Heartbreak his art is full of small, unsteady lines that give the impression that he works entirely in ballpoint pen rather than pencils. Perhaps he does. The lines cover everything, defining each surface with a ping like a bat’s sonar. The technique splits the difference between pencils and inks. It maintains sketched elements like the ball of a nose or the tendons in a neck, but has clear strokes that define space and contain color. The color is what truly sets this apart – bold, neon, and speckled. An interview with his local paper describes Stanley’s process: “He spray-painted color swatches of airy pastels and faded neon and scanned them into Photoshop, where he made a palette.” That means shading is left to the line-work rather than digital gradients, with the pen-strokes floating above the color fill. Also, for a first-time creator, his lettering is impeccable. The result is a world that feels futuristic and lived in, with plenty of texture to catch your eye. While his figures have an occasional gawkiness, it’s never due to improper proportions. Instead, they feel like real people who are not always symmetrical or in a perfectly attractive pose. Ida and Kumi are especially well-developed, their eyes and lips distinct in both shape and expression. The pair of women have the same put-upon, barely-getting-by feel as Malcolm Reynolds and his Firefly crew, with as many tricks up their sleeves. As on Firefly, it’s the depth of their relationship that shines fiercely. Not defined as friendship, sisterhood, or romance, instead the connection is shaped by their body language and the tension of their silences. Their opposite pair are rogue captain Ben Baces and his mysterious muscle Nim, who seem at odds even when they are agreeing to something. 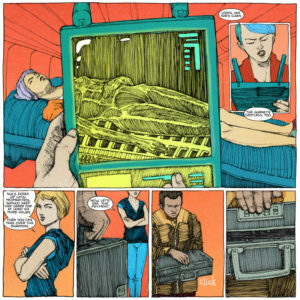 Stanley drops in many small touches that depict a more fully-formed world beyond the edges of the page, from slang (“aw, shreds”), to technology (a tiny orb of a music player, an organic silk knife, a disturbing self-destruct mechanism), to universe-building (the many named quadrants, their ship as a “repurposed control node,” why someone would need a blank). Ida and Kumi came from an intriguing adventure, and the close of this story sets up more danger in their future. Heartbreak Quadrant was originally published as the result of a modestly-budgeted Kickstarter campaign. That means there is no guaranteed second volume in our future. Does that make this oddly shaped 10″ x 10″ edition any less attractive to read or own? I don’t think so, but perhaps this story feels a bit small or inconsequential when considered as a small thing that is marooned without a sure sequel. So much of what is intriguing here is due to the promise of what awaits in the wider world outside this single conflict. It would be a pity if we don’t get to see more of it. Stanley says he’s already at work on a second volume of a planned six. I can’t wait to read it!